Arsenal moved above Tottenham into third in the Premier League table with a 2-0 defeat of Newcastle United on Monday.Arsenal edged to a 10th Premier League home win in a row against Newcastle United, thanks to Aaron Ramsey and Alexandre Lacazette. 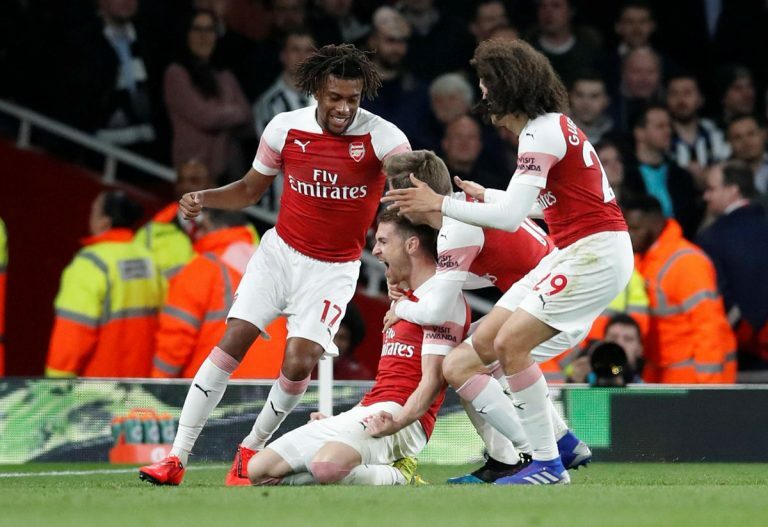 Aaron Ramsey, bound for Juventus after this season, struck his fourth league goal of 2018-19 before Alexandre Lacazette settled a somewhat scrappy encounter at Emirates Stadium. Unai Emery’s side were far from their best, but Ramsey’s display while wearing the captain’s armband was significant, and his departure with an apparent injury in the second half will come as something of a worry. Newcastle, who rarely threatened Bernd Leno’s goal, remain seven points above the bottom three despite a 12th league defeat in their past 13 meetings with the Gunners, which was confirmed by Lacazette’s lobbed finish seven minutes from time. Arsenal thought they had the lead 13 minutes in through Ramsey, but his close-range finish was disallowed after Sokratis Papastathopoulos pulled over Florian Lejeune. Ramsey had better luck half an hour in, though, sweeping a left-foot shot away from Martin Dubravka and in off the right-hand post with the first registered shot of the match. Salomon Rondon had Leno a little worried with a low effort, but only a brilliant goal-line clearance from Matt Ritchie stopped Lacazette from rifling in Arsenal’s second just before the break. Arsenal’s dominance of the ball continued after the interval, but chances seemed hard to come by, with Dubravka making his first save of the match 73 minutes in from a stinging shot by Pierre-Emerick Aubameyang. Just as Newcastle began to threaten a leveller, Lacazette pounced on some hesitant defending from Jamaal Lascelles to lift the ball over Dubravka and secure the points. The win against Newscastle means Arsenal have match Manchester City’s record of winning all their 2019 home games in the Premier League making it 5 wins out of 5 games. This was Arsenal’s 10th win in a row in the league at the Emirates, and it puts them two points above Spurs and Manchester United with seven games to go. It is their home form that has kept the Gunners’ Champions League hopes in their own hands – indeed, they have not been beaten on their own turf in the top flight since Manchester City won 2-0 back in August. At the moment, they look likely to fill one of the two top-four spots beneath City and Liverpool come the end of the season. – Arsenal have won 10 consecutive Premier League home games within the same season for the first time since May 1998. – Arsenal have kept three consecutive clean sheets in all competitions for the first time since December 2017. – There were just 10 shots in this match, the fewest in a Premier League game since Bournemouth vs Leicester in August 2015 (nine). – Newcastle United have lost 28 Premier League games against Arsenal – versus no other side have they lost more in the competition.